is the new chairman of the national conservative group ALEC. 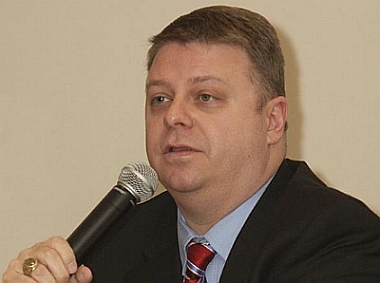 The American Legislative Exchange Council has a new chairman – North Carolina Rep. Jason Saine. The corporate backed ALEC is a national conservative group that proposes model legislation for state legislators. The group’s model bills frequently make it to the N.C. legislature virtually unchanged. Saine, a Lincolnton Republican, begins his one year tenure as head of the national conservative group on January 1. Currently the head of the House Finance Committee, Saine is well connected with the GOP leadership in the legislature – but he also has his critics on the left and the right. Notoriously Saine, who himself depended on state unemployment checks for more than a year before joining the House in 2011, voted to cut those benefits once in office. At the time, North Carolina had the fifth highest unemployment rate in the nation. seat by his county’s Republican party, which he chaired. There are those on the political right who have long-criticized Saine as self-dealing and hypocritical, questioning everything from his campaign finances to his purity as a conservative.